+ The writer, Mohit Kumar Jolly, is a graduate student at the University of Rice. This week he is blogging from the Lindau Nobel Laureates meeting. An ageing population is going to be one of the greatest challenges of the 21st century, but solutions around the world differ wildly. Spot India and China in the chart below, and then hope that India’s health minister Harsh Vardhan will start acting rather than creating controversies. Those in the US can weep a little, too. 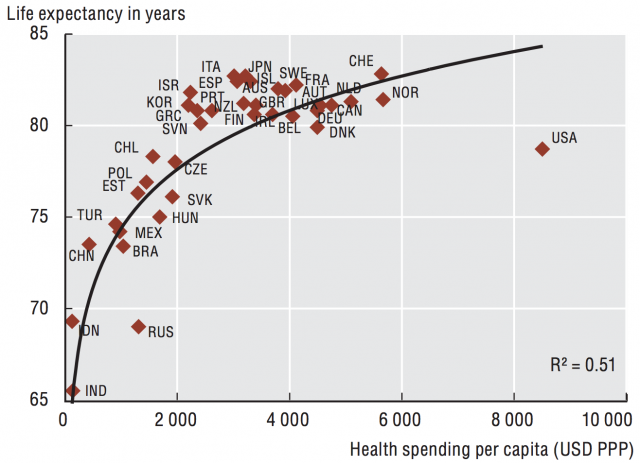 Credit: 2013 health report by the OECD. For more, follow the curators Mukunth and Akshat. Get in touch with us at curiousbends@gmail.com.